Frontlines 3 If it's new, it's here. Plus Hacking Away, From the Hip and Hard Facts too! Will you be Snowbound this summer? Who's an April Fool then? Has Legend got a superiority Komplex? Is your thigh bone connected to your knee bone? Is YS doomed? Find the answers to these and other curious questions in ... Frontlines! POKE fun into your games! Send your hacking hints to Andrew Pennell ... Monty Mole, Horace and the Spiders, Horace Goes Skiing, Stop the Express, Arcadia, Frank N Stein, Adventure Quest. From dodgy 'drives to suspect Speccies, Stephen Adams makes the connection - contact him at Hard Facts ... Stack Light Rifle, ICL 22SI video console, Microdrive errors. Loading & saving headerless files, Rounding numbers, Spectrum 'QL-clone' upgrade. Hackers keep out! All new hints 'n' tips for gamesplayers only! So, c'mon play the game! Are you hacked off with hackers? Would you have trouble hacking your own hands off? You couldn't even POKE yourself in the eye! If you play games but don't play about with them, this is the page for you. What you'll find is everything for the pure games player. So, c'mon play the game! Everyone's a Wally. Judge, jury and executioner, all rolled into one - Dave Nicholls, Roger Willis and Ross Holman - pass sentence on this month's selection of supreme Spectrum software. Forget the pens and paintbrushes - how about painting with pixels? Penny Page has taken a peek at four new graphics packages and Peter Shaw completes the picture. OK, we'll come clean - we did know where the extra room in Jet Set Willy was. And it wasn't long before you all found it as well. Now Dave Nicholls shows you how you can start re-arranging the furniture in Willy's mansion. Welcome to the YS Space Academy. Here you'll receive full in-flight training from Space Commander, Ross Holman. Master the techniques of time travelling in Starion, the stunning new 3D space game from Melbourne House. Time waits for no man, so go for it now! Join Chris Wood on a journey through time and space - into the centre of Starion. If you're not that flush, but you need a printer, stay cool and go thermal. Peter Green comes in from the cold to consider the hottest ones around. Pick up a handful of your old screen pics and mix them together to create some stunning new visuals. Chris Somerville sketches out the possibilities. If you thought all had gone quiet on YS MegaBasic, keep listening 'cos we're about to break the sound barrier. Prepare to have your ears pierced by L A Privett's program on the MegaBasic PLAY command. Something for everyone in this month's Program Power. Arcade addicts'll go headlong for the Gold Rush (M Rai) and Shooting Gallery (Adam Leonard), and all you clever clogs'll want to Drop Out (B Herivel & M Rapps) and TasCount (Malcolm Paknadel) is one utility that'll have you out for the count! Get those programs powered up. This is the biggie! Five Opus Discovery disk drives must be won in our mighty mega compo. Turn those pages fast! Our competition castaway this month is ... you! But dwelling on our desert island could lead you to an important discovery - an Opus Discovery. Here's your chance to win one of five fantastic disk drives, worth a grand total of £1,000! Save £££s off selected software in our special readers' offer! What's this? - the YS Top 10 and news of our great chart challenge. Check it out! If you're an all-time great games player, you could be in line for a medal. Go for it now - it's gold! Bet you never knew there was so much in it! Write on! 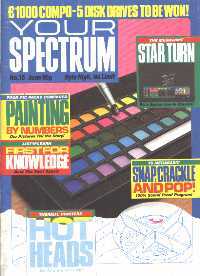 Write to us - there's a bundle of free Spectrum software for this month's Star Letter! Positively your last, never to be repeated, chance to pick up the miracle Basic at an all time low of £7.95! Tap your telephone with a Prism VTX 5000. Dial up a great deal now. Do a deal and make a friend, with a freebie YS classified ad!